Last week, I was going over this Coin World article to update the mintage figures on this guide's American Silver Eagle page so they would better reflect the new information found in the article. 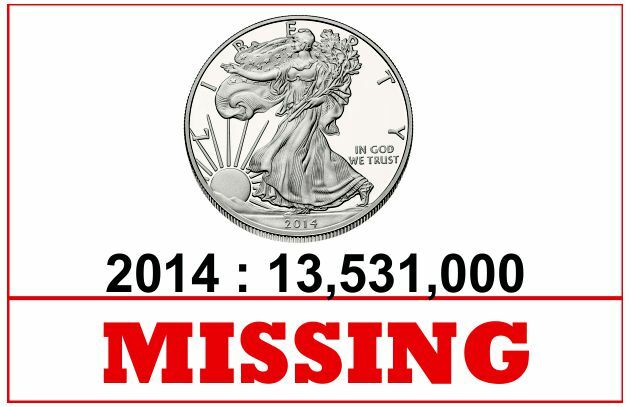 In my last blog post, on this subject, MISSING : 2014 American Silver Eagles, I wrote in detail about in the issues I found concerning the mintage figures for 2014 American Silver Eagle Bullion Coins. Mr. Gibbs forwarded my email to the author of the Coin World article; Mr. Paul Gilkes. He informed me that his Managing Editor, (who I sent my first email to: seen here), alerted him to my email inquiry, he stated that didn't respond because he was on vacation. From there, the email went from cordial to disrespectful, he stated the following in his email "There are NO missing coins. The 44,006,000 figure reflects SALES during calendar year 2014, not the number of coins DATED 2014." I would like to respond to your email further; as I mentioned in my last email to you I know the differences between the mintage figures and sales figures. 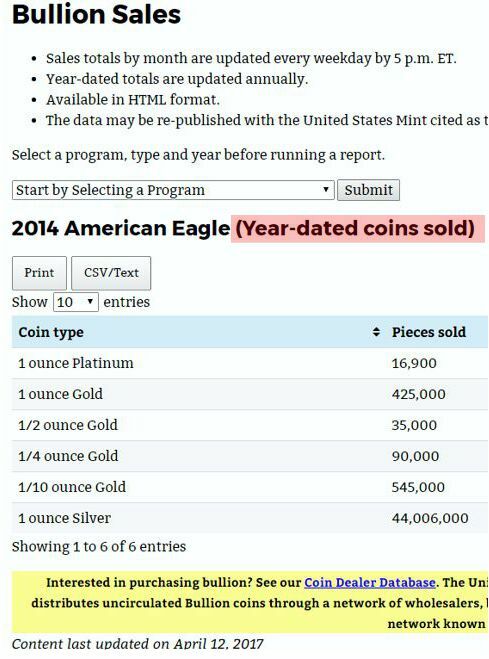 Below is a breakdown from my website’s American Silver Eagles page (the numbers were retrieved from the U.S. Mint’s old website). As you scroll down and view the mintage and sales numbers you’ll see that in no year was there ever a difference between the sales and mintage numbers of even 2.1 million coins, let alone 13+ million coins (the difference between the number of coins sold in 2014 (according to the US Mint) and the number of 2014-dated coins that were minted according to the Department of the Treasury’s response to your FOIA request). Furthermore, the mintage numbers for 2013 by the U.S. Mint have been recorded as 42,675,000, and in your article, the U.S. Treasury’s 2015 mintage from all three U.S. Mints add up to 47,000,140, just 140 American silver eagles over that year’s mintage. So, from what year are the extra 13.5 million coins sold in 2014? The point is something is wrong here, I don’t know what and I’m not accusing Coin World of anything. I’m not accusing anyone of anything; I’m simply pointing out a clear discrepancy and would like some answers. In conclusion, I wanted to let you know that I won’t be calling you today, I’ve had the flu for the last 4-days and I still am not over it and I doubt you want someone to be sneezing, coughing and sniffing in your ear. Furthermore, Mel Kassenoff an annual collaborator of the World Coin Book and who helped me with the mintage/sales figures on all of my website’s American Eagle bullion coin pages; agrees with my point of view on this subject and has sent a request to the U.S. Mint for clarification of the Mintage and Sales of all American Silver Eagles. (1986-2016). Depending on their response, he may use the FOIA to obtain more information as well. I will also be sending a copy of this email to your managing editor. I sent that email about an hour ago, it is now 11:50am (ET). I will keep you informed as I find out more information.